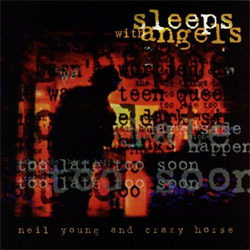 Sleeps with Angels is Neil Young's twenty-first studio album and recorded with Crazy Horse. It was released in August 1994 and produced by David Briggs and Neil Young. Since the recordings of Harvest Moon Neil Young had released a compilation album (Lucky Thirteen) and recorded a song, “Philadelphia”, was included in the soundtrack to the motion picture with the same name from 1993. “Philadelphia” was a piano driven ballad that resemblance with some of the songs on Sleeps with Angels album. The guitar was however present in the songs on Sleeps with Angels, with the overdriven way that often marks the sound of Neil Young. Therefore, Sleeps with Angels has probably more similarities with Zuma than Harvest Moon and with the over 14 minutes long “Change Your Mind” as a counterpart to “Cortez the Killer”. A curious fact is that Neil Young also played a flute on the album.